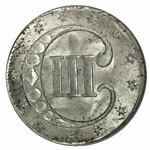 The silver three-cent piece, or "trime" as it sometimes is called, was introduced in 1851 as the United States' first subsidiary silver coin. Initially struck from silver that was only .750 fine, its intrinsic or bullion value was significantly below its face value, so it was thus subsidiary to silver coins of the 1837 legal standard. This reduced intrinsic value permitted the trime to circulate at a time when more valuable silver coins were hoarded. This principle of controlled debasement was extended to the other fractional silver coins in 1853, and the standard of the three-cent piece was then elevated to .900 fine to be in conformance with them. When all silver coins disappeared from circulation after the suspension of specie (coin) payments by banks in 1862, an even more drastic solution was found. The three-cent and five-cent pieces were initially replaced with paper currency of those values and were subsequently coined in copper-nickel. So successful were the new coins that the silver three-cent piece, already long absent from circulation, was terminated by the Mint Act of 1873. 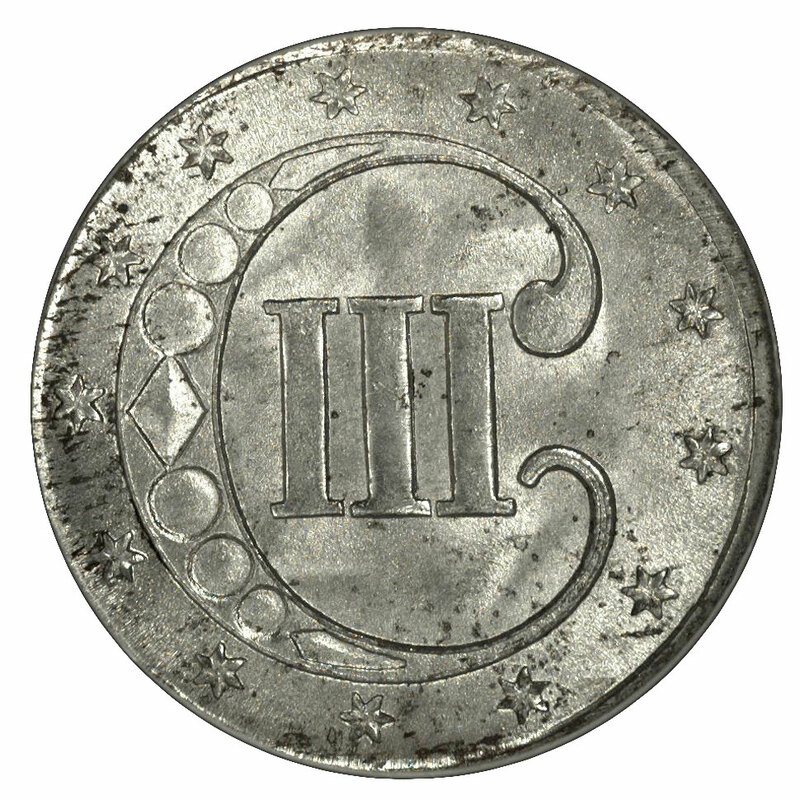 Although it was quite simple, James B. Longacre's design for the silver three-cent piece caused the Philadelphia Mint a great deal of difficulty (the sole branch mint issue was the New Orleans emission of 1851). Try as it might, the coiners could rarely bring up a full strike with currency pieces. Three similar but distinctive subtypes of the little trime were produced, all in an attempt to relieve this problem. 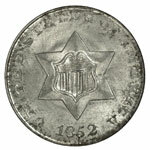 The first (1851-53) had no outline to the large obverse star. 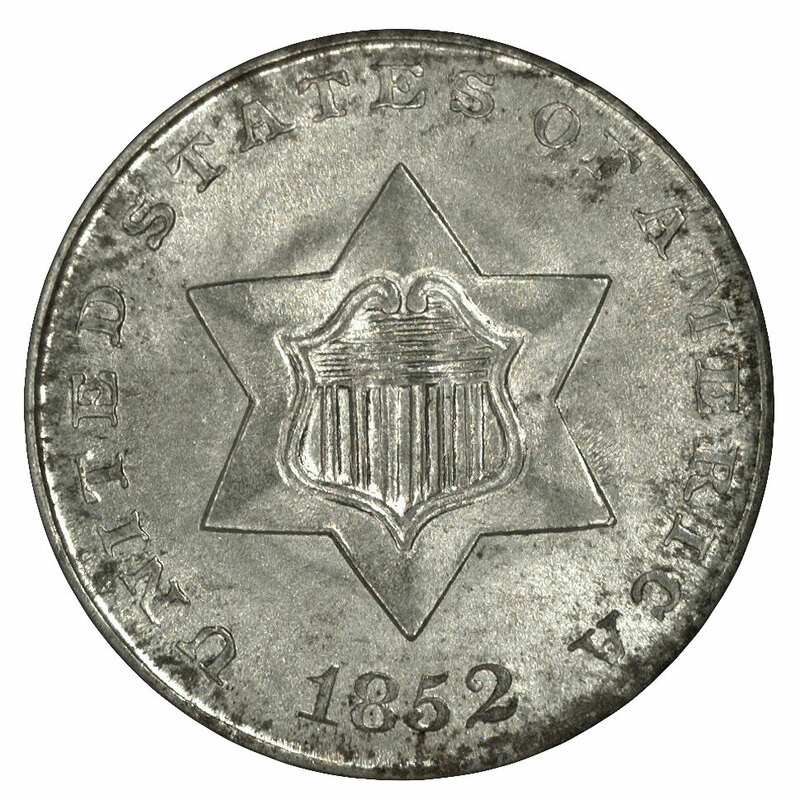 The second type (1854-58) featured three outlines to the star and added an olive branch and bundle of arrows to the reverse. The third and final type (1859-73) saw the outlines reduced to two and the lettering restyled by Assistant Engraver Anthony C. Paquet. Grading circulated examples of all three issues can be difficult because of the uneven strike typical of most pieces. This is especially true of Type 2 coins, as these were most susceptible to striking problems. The Official American Numismatic Association Grading Standards for United States Coins acknowledges this peculiarity and adds that Type 1 coins, because of their lower silver content, are not as lustrous as later pieces. As a rule, contact marks are not common on these very small, lightweight coins. Instead, other factors come into play when a mint state coin is assigned a low grade. The most significant of these is the aforementioned dullness, often aggravated by dipping in chemical cleaners in an effort to bring out the luster. The majority of mint state Type 1 trimes have a disappointing surface appearance, and this is accentuated by an incomplete strike. Because of their higher silver content, Type 2 specimens are more lustrous, but they are scarcer in overall numbers and even more subject to striking problems. It's the Type 3 coins of 1859 and later that usually have the most satisfying eye appeal. Unfortunately, the type collector has relatively few dates from which to choose, as specimens dated 1863-72 are quite scarce in mint state (1873 was a proof-only date). This denomination disappeared from circulation by 1863, and thereafter only token numbers were coined from 1863 to 1873 to justify the continued sale of proofs to collectors. Because the tiny mintages of trimes from these later years resulted in dies that retained all or nearly all their initial brilliance, even the professional graders at NGC sometimes have difficulty distinguishing between mint state and proof specimens dated 1863-72. Most of the currency pieces of these years are delightfully prooflike and quite confusing to those unfamiliar with their characteristics. The best solution for collectors attempting to complete a date set of non-proofs is to acquire certified coins. These typically are more valuable than the more common proofs, so there's an economic incentive to be certain about their attribution.